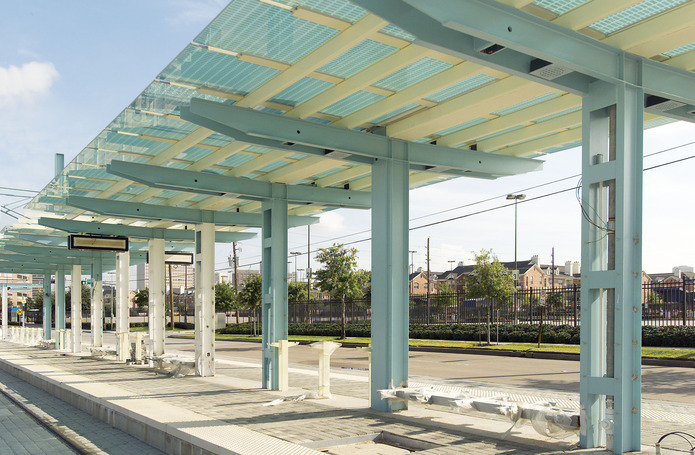 The project consists of 16 separate light rail passenger drop-off and loading platforms along the 7.5 mile long rail route from the Astrodome to the downtown main Metro building in Houston. Each station has a custom glass canopy roof. Steel columns are clad in granite, porcelain metal panels, stainless steel panels or custom mosaic ceramic tile. Each station has concrete unit brick pavers, sidewalks, terrazzo sidewalks, or granite paver sidewalks, depending on the location. Each station has custom stainless steel seating, handrails and guardrails. Two buildings are included in this project, one a 600sf train crew restroom/ break room building and the second is a 1,000sf power sub station building. Local artist contributed to the design of each station giving special consideration to the glass and ceramic roofing. Landscaping, irrigation, electrical lighting, roof drains for plumbing and painting at each location are included.